The US is already the only major economy that is refusing to partake in OECD information sharing agreements. Both the US under President Trump and post-Brexit UK under Prime Minister May have strong tax haven inclinations and are poised to undermine the current wave of cooperation intended to prevent international personal tax abuse. Richard Murphy's Dirty Secrets: How Tax Havens Destroy the Economy establishes that tax havens are ubiquitous, that they must be regulated, and puts forward a vision of what the world could look like without them. Dirty Secrets is 40% off until April 10 (midnight UTC). Tax havens harm the economy. Not just any economy: every economy. That’s the argument I make in my new book ‘Dirty Secrets’. Tax havens are amorphous things. Defining them is hard because they come in so many shapes and forms. What can be said is that all of them create laws and regulations that are not intended to be for the benefit of their own population but are instead of benefit to people who live elsewhere in the world. What is more, most of them create deliberate veils of secrecy that prevent those making use of these regulations from being identified, and most especially by the place where those tax haven users really live. Looked at in this way tax havens are much more pernicious than popular perception suggests. That’s because they are not just about beating the tax system of other countries (which is harmful enough, and little short of an act of economic warfare) but they also have the specific aim of undermining the fair markets on which our local, national and international economies depend. There are three ways they do this. All should be obvious to anyone who has studied economics. First, those who have done so will know that effective markets that allocate resources efficiently require what economists call ‘perfect information’. That means (absurd as it sounds) that everyone has to know everything about everyone else’s intentions in the market. Now, I admit, that perfect information never exists, simply because it is obviously impossible that it can. But what is true is that the closer markets get to fulfilling this assumption the more likely it is that business risk will be low. That’s because businesses will know who can, and cannot pay them for what is sold, and so avoid bad debt. And investors will also have the information they need on which corporations are good at using their capital, and which aren’t. What tax haven secrecy does is deny businesses and investors that essential information. The result is that risk goes up, and so the rate of return required on investments increases, which reduces the amount of investment that actually takes place, which in turn cuts productivity, and that reduces real wage rates, and so GDP, and the result is we all suffer as a result. But that’s only the first cost that tax havens impose on us. The second is that tax havens create unfair competition between businesses. That is because some business will, as a result of their inability to access tax havens, pay tax and whilst their competitors who can use tax havens will not. This matters because to work properly markets require that all businesses compete on a level playing field. With tax havens in the mix that clearly does not happen. And that means that those that do not pay tax have an unfair competitive advantage over those that do. This means that they can either undercut their tax paying competitors on price or they can invest more out of their after tax profits, which will of course be bigger because little or no tax will be paid. The result is that the taxpaying businesses tend to disappear: they simply can’t compete. But that’s not how markets are meant to work. Their rule for the survival of the fittest is meant to be based on the ability of a corporation to meet our needs as consumers, and not on their ability to hire tax-smart attorneys. And what we end up with because this basic market rule has been distorted is what looks, all too often, very like monopolies, which have always been the antithesis of market capitalism. There’s a third problem to add on top of these two. Tax havens are now key to the concentration of wealth that is fast becoming a problem for all of the world’s major economies. It was not long ago that local laws on inheritance and trusts meant that even the biggest estates were eventually dissipated to the real live, warm-blooded heirs of those who created them. But offshore tax havens have re-written those rules. Now the wealth can stay offshore in perpetuity and there’s very little the heirs can do about it. There is, however, a problem in this. Professional trustees are notoriously risk averse. They don’t invest in start-ups. They do look for really boring returns, like those from property rents. And this denies entrepreneurs, whether in the next generation of wealthy families, or in the market more generally, access to the capital they need at a price they can afford to bring their ideas to market. And yet the development of those new ideas is exactly what has to happen if the innovation that is the supposed keystone of market economies is to occur. Add these three fundamental economic problems together and it is apparent that tax havens threaten the existence of fair markets. Add on top of that the fact that they leave government’s short of revenue and the problem is compounded. Inefficient markets and cash strapped governments unable to access or tax ever-growing piles of offshore money that threatens to destabilise society by pushing prices of real estate beyond levels that most people will ever be able to afford threatens just about all the underpinnings of the prosperity that has created western market economies. All of this matters to our well-being. It also matters for our politics. Isolationist states, like the US seems to be becoming under President Trump and which post-Brexit UK looks to be heading for under Prime Minister May, have strong tax haven inclinations. The US is already the only major economy that is refusing to partake in OECD information sharing agreements designed to prevent international personal tax abuse. And if it moves towards a destination based corporation tax system (as Paul Ryan would like) it could seriously undermine the current wave of cooperation between states intended to tackle international tax abuse. The UK could do much the same, with suggestion being heard that ministers would like to create ‘Singapore on the Thames’ to force its former European partners into a trade agreement or face the threat of tax competition. These though are not neutral acts. If my analysis noted here is right (and both economic theory and factual evidence suggests that it is) then having the UK and US promote more tax haven-like behaviour would threaten markets, promote tax and market abuse, increase tax costs for those who comply with the law, cut investment, reduce real wages, deny entrepreneurs new market opportunities and reduce our national income. That’s not a prospect to be relished by anyone wherever they are on the political spectrum. The fact is that tax haven’s Dirty Secrets have a cost, and you might be paying it. That means this is not an issue you can be indifferent about. This is very personal, and I suggest you need to say so. Tax havens cost you money, opportunity and well-being. If that is not enough to make you angry, what is? 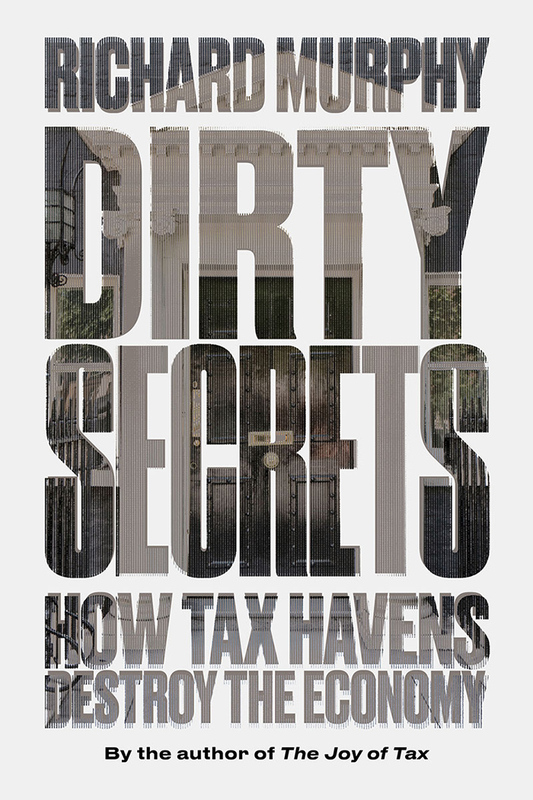 Dirty Secrets, Richard Murphy's cogent analysis of tax havens and how to get rid of them, is 40% off (with free shipping and bundled ebook) until April 10.